Duane has been called one of the world's finest magicians. His novel approach to, and great respect for, the art of magic makes his shows outstanding. Presented by one of the world's master magicians, his shows provide something for everyone. 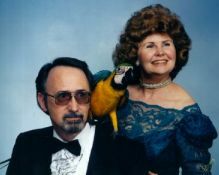 Duane has been a professional magician for over 25 years, performing in parlors, banquet rooms, on stage, and even on television! As a performer, Duane uses the craft of magic to create an atmosphere of mystery, using light and special effects. Then, he changes the tone of the show using his personable style of drawing the audience to him with a humorous audience participation portion of the show. The effect is timeless, profound and unforgettable. Duane performs in all venues, from intimate parties to corporate conferences and banquets. He can meet your needs whether it is after-dinner entertainment, or a full two-hour full-blown stage extravaganza.